Jeanneau has made a splash breaking into the market for deck-saloon cruisers over the past few years, but it has also done a very good job of updating its bread-and-butter boats, as seen in the new Sun Odyssey 49. The SO 49 replaces the SO 45, a staple boat in charter fleets around the world, and, like its predecessor, it is very focused on the needs of this market. I tested the boat on a delivery from Newport, Rhode Island, to Huntington, New York, this past fall. Ours was a three-cabin boat with two heads (as opposed to the more charter-oriented four-cabin/four-head layout), and I was quite impressed with the use of space. I particularly liked the super-sized nav station. It features a long nav desk with scads of drawer space underneath and plenty of room for electronics, plus a cool S-shaped nav seat. You can either sit upright on the seat facing the desk, well-cradled by the humps of the S, or you can recline on it, parallel to the desk, and comfortably cop a few Zs. Another versatile feature is the twin aft cabins, which are separated by a collapsible bulkhead that can be removed to create a super-huge double bunk. While under way, even pounding into a headwind, the fungible bulkhead, I noted, did not rattle or vibrate. The deck layout is fairly standard for a modern charter-oriented boat of this size. Twin wheels provide excellent all-around visibility, and the fixed cockpit table makes a great foot brace in the super-wide cockpit when the boat is well heeled. Up forward, there is also a full-size, segregated sail locker with a ladder leading down into it, a feature normally found only on larger boats. As far as the sailing goes, our boat had an in-mast furling main, but I was surprised by how little it diminished performance. 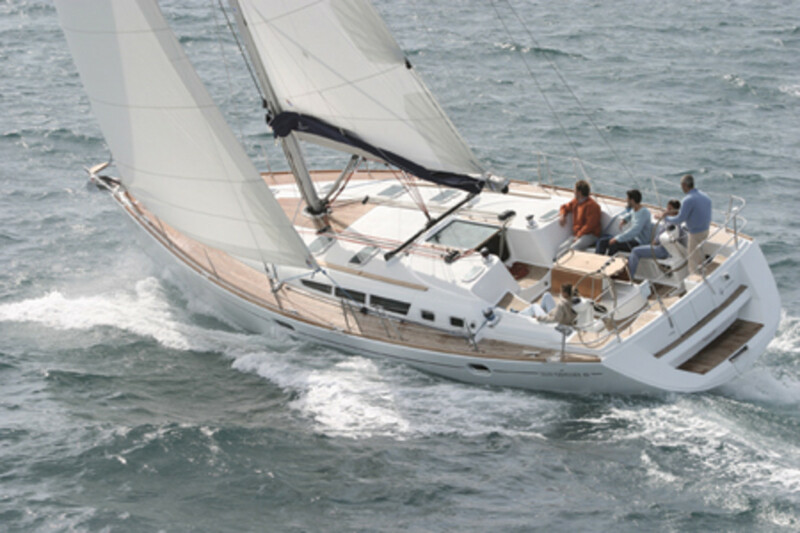 I have always enjoyed sailing Jeanneaus—their helms have a smooth, positive feel with a fat sweet spot; their sailplans are powerful but not overwhelming; their hulls have good initial stability and track well—and this one was no exception. Beating up Long Island Sound into a 20-knot headwind, we made better than 8 knots through the water under full sail and were quite comfortable doing it. The motion was mild, and the boat felt quite solid. We achieved top speed at an apparent-wind angle of 45 degrees; at 40 degrees, we were a knot slower but did not feel as though we were wallowing. Under power, in flat water with no wind in Narragansett Bay, we made 7.3 knots at 2,800 rpm. In sum, I&apos;d say this Sun Odyssey is a worthy successor to its ancestors—solid, predictable, and fun to sail, with a very useful multifaceted interior layout.